I’ve got a bit of a country style going on today. It was mostly inspired by items from ‘The Hive’ which are out at TLC for this round. When I was a kid, I had a horse in RL and whenever I see horse or country inspired items in SL I just buy it without thinking. Makes me remember all the rides on the open fields… And feeling a little wild and free! Anyway… Back to what I was saying. The Hive created this country inspired set complete with a saddle rack, horse through and a wagon wheel. There’s more items, so go see for yourself. I love it! It’s a new to me store, but I’ll be paying attention to future items from them for sure! Also, the guitar behind me and my pug is from Seven Emporium and is out at C88. The lamps hanging on the barn are from Revival and can be found at Shiny Shabby. The trees are from Little Branch and are a must have for the landscapers among us. On to my outfit! The hair I’m wearing is from Entwined and can be found at Shiny Shabby. I love this hairstyle. It’s fun and relaxed. And it was a perfect match, if you ask me, with this hat from LaGyo. 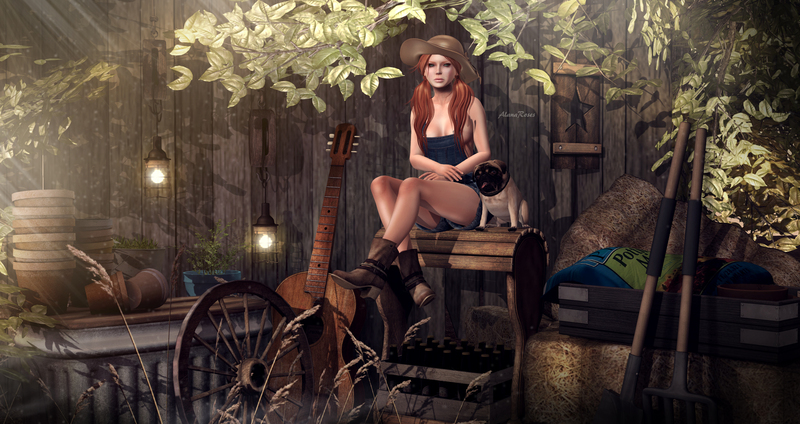 I paired it with JD’s new boots called ‘Neva’, also out at Shiny Shabby. They come with socks, but I choose not to wear them this time. And by adding Emery’s new jeans, I completed my country outfit! Here to show you this new gacha set from HAIKEI which is available at this round of Kustom9! I’ve added the vendor add at the bottom of this post so you can all see how cute it is. 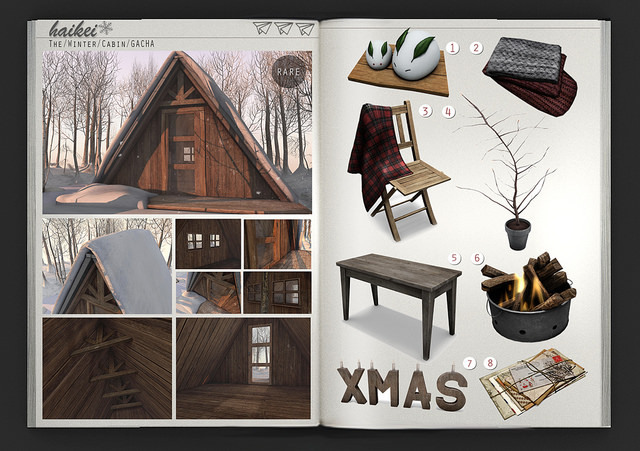 There are 8 commons to win and one rare, being the Winter cabin. Like always, the texturing is amazing which makes it so easy to use in pictures and to decorate it. And it will fit on every winter sim. I am so loving this jacket from Gawk! It’s available at Winter Trend and comes in a lot of different colors. Definitely worth demo-ing! The pants I’m wearing are from Emery and to be honest, I’m having a hard time taking them off. That’s how much I love them. We’ve paired our outfits with the snowboots from FLite, which are still available at The Arcade. Autumn is here… Which is my absolute favorite season of the year. I love everything about it. The colors, the scent… Sometimes even the rain. But that might be because I’m a November child and I’m programmed to love this colorful and cozy season. I have so much to show you! So I decided to split this post up in two. First post will be about me and Xander. And I’ll do a more elaborate post on the house, which is a new gorgeous build from HAIKEI, later. As you can see there are a lot of decor items behind us also and I wanna show you a close up of these gorgeous items.